Mexico's Maria del Rosario Espinoza (right) raises a hand of Norway's Nina Solheim after winning the gold in the women's +67kg final match on the fourth and final day of the taekwondo competition at the 2008 Beijing Olympic Games at the University of Science and Technology Beijing Gymnasium in Beijing, China on Aug. 23, 2008. The taekwondo competition at the 2008 Beijing Olympic Games wrapped up after four days of competition in Beijing, China on Aug. 23, 2008, with a record 22 countries winning at least one medal. Starting with the 2008 Beijing Olympic Games, a total of 32 medals were up for grabs. Eighteen countries took home at least one medal at the 2000 Sydney Olympic Games, compared with 13 nations at the 2004 Athens Olympic Games. 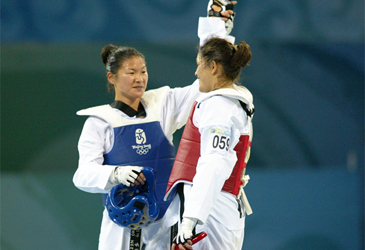 Korea took home four gold medals out of a total of eight, reaffirming its supremacy in the sport. Mexico came next with two gold medals, followed by host China with one gold and one bronze. Iran took home one gold. The United States followed with one silver and two bronzes, while Turkey earned one silver and one bronze. Canada, the Dominican Republic, Greece, Italy, Norway and Thailand each clinched one silver. Croatia and Chinese Taipei took two bronzes each. Eight countries — Afghanistan, Brazil, Cuba, France, Great Britain, Kazakhstan, Nigeria and Venezuela – managed to grab one bronze. Afghanistan, which qualified for the Beijing Olympic taekwondo competition for the first time in its Olympic history, clinched its first-ever medal at the Olympic Games. On the fourth and final day of the four-day taekwondo competition on Aug. 23, Mexico's Maria del Rosario Espinoza, the first placer at the 2007 WTF World Taekwondo Championships, outpoints Norway's Nina Solheim, the bronze medalist at the WTF World Taekwondo Qualification Tournament, in the women's +67kg final match to win the gold medal. Brazil's Natalia Falavigna, the fourth placer in the same division at the 2004 Athens Olympics, and Great Britain's Sarah Stevenson, in her third Olympic appearance, each won the bronze medal in the same division. In the men's +80kg final match, Korea's Cha Dong Min brushed aside a stiff challenge from Greece's Alexandros Nikolaidis, the silver medal winner at the 2004 Athens Olympic Games, for the gold medal. The bronze went to Kazakhstan's Arman Chilmanov, the first placer at the Asian Taekwondo Qualification Tournament, and Nigeria's Chika Yagazie Chukwumerije, the second finisher at the African Taekwondo Qualification Tournament.